A new research report, ‘The Business End of Climate Change’ launched today at the Business & Climate Summit in London’s Guildhall puts a figure for the first time on what greenhouse gas emissions cuts could be achieved by business worldwide. 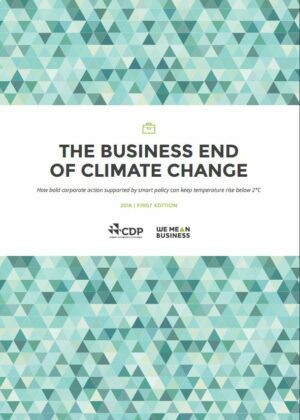 The report examines what will be achieved by the plans of five key global business initiatives (RE100; EP100; Science Based Targets; Zero De-forestation & LCTPi) on climate action currently underway and compares this to what could happen if all relevant companies were to sign up to these initiatives and implement their plans. the number of companies signing up to these initiatives could rise from 300 today to over 3500 by 2030. The current BDC to climate action of 3.7bn metric tons of CO2 equivalent a year represents over 60% of the total emissions cuts (6bn metric tonnes by 2030) pledged by all countries in the Paris Climate Agreement through their own Nationally Determined Contributions (NDCs). It is the equivalent of taking over 1000 coal-fired power stations permanently out of use, almost 75% of the world’s total. Business is not waiting until 2030 to play its part. In total, around 300 leading companies have already signed up to the five climate action initiatives that the report analyzes. Companies signing up to the initiatives come from all over the world in all different sectors, and are joining in growing numbers – over the last twelve months (June 2015-May 2016), 174 companies signed up to these initiatives, compared to 49 companies in the previous twelve months (June 2014-May2015). Kellogg Company has cut its carbon emissions by 14% per metric tonne of food produced since 2005. In 2015, the company committed to ambitious Science Based Targets, including a 65 % reduction in emissions from its operations by 2050, and engaging suppliers to help them reduce emissions by 50% by 2050. Autodesk, one of the world’s leading software companies, announced this month that it has achieved its target to power all of its facilities entirely with renewable electricity. Going forward the business has set an internal carbon price that will help align decisions and investments with a low-carbon economy. IKEA Group has committed to going 100% renewable, generating as much renewable energy as the total energy it consumes in its buildings by 2020. The company is a founding partner of the RE100 campaign and has committed to cutting its emissions in line with Science-Based targets. IKEA Group has invested €1.5 billion in renewables since 2009 and pledged a further €600 million last year. By 2030, the initiatives plan to have more than 3500 companies signed up, driving forward the low-carbon economy. The report acknowledges that whilst leading companies are already engaged in taking climate action, and many more are ready to sign up to make new commitments, there remains a long way still to go to achieve the sub 2°C goal agreed by countries in Paris at COP21. The report looks at what might be achieved if all relevant companies were encouraged to sign up to the five initiatives. Under such a scenario, it found that business would cut emissions by around 10bn metric tons per year. This potential BDC is equivalent to what China, the world’s largest emitter, pumps out in total CO2 emissions annually and alone it would take us well over half way to a sub 2°C world. reduce the administrative and cost burden of certification for producers, so it’s easier for them to produce commodities without deforestation. One, governments removing barriers and creating incentives that enable companies to be even more ambitious in their efforts to cut emissions. Two, leading companies already committed to significant climate action raising the ambition of their peers by demonstrating the scale of the economic opportunity. The report recognises this is a starting point and not a complete picture of business action. There are many other business initiatives out there aimed at reducing emissions, and a process has been outlined to capture them in future editions of what will become an annual report. Find out more at www.businessendofclimate.org. Hey Buddy!, I found this information for you: "Business will be key driver of global climate action, new research report reveals". Here is the website link: https://www.duurzaam-ondernemen.nl/business-will-be-key-driver-of-global-climate-action-new-research-report-reveals/. Thank you.